The EQ effect consists of 6 tone control sections. The overall transfer is displayed in the display at the top. The colored dots correspond to the 6 sections. You can move them to control the section Gain and Frequency knobs. Each section has its own Bypass button. The Bass section can be a shelving or bell-type equalizer. Boost/Attenuation can be -12 dB to +12 dB. Frequency can be 20 Hz to 1 kHz. If the Vintage button is active the equalizer follows the classic Baxandall curves: cutting low frequencies will be accompanied with a slight boost of the lower-middle range and vice versa. If the Shelve button is active no dipping or peaking will occur. If the Bell button is active the equalizer will affect a one octave band only. The Lo Mid section is a parametric equalizer. The center frequency can be 50 Hz up to 2 kHz. The Bandwidth can be 0.05 to 2 octaves. The Gain can be -12 dB to +12 dB. The section is inactive when Gain is zero (the green indicator will dim). The Hi Mid section is a parametric equalizer. The center frequency can be 500 Hz up to 12 kHz. The Bandwidth can be 0.05 to 2 octaves. The Gain can be -12 dB to +12 dB. The section is inactive when Gain is zero (the green indicator will dim). The Treble section can be a shelving or bell-type equalizer. Boost/Attenuation can be -12 dB to +12 dB. Frequency can be 1 kHz to 20 kHz. If the Vintage button is active the equalizer follows the classic Baxandall curves: cutting high frequencies will be accompanied with a slight boost of the upper-middle range and vice versa. If the Shelve button is active no dipping or peaking will occur. If the Bell button is active the equalizer will affect a one octave band only. The actual frequency spectrum of the audio signal can be shown in the graph. This can be a great help in setting up the EQ. 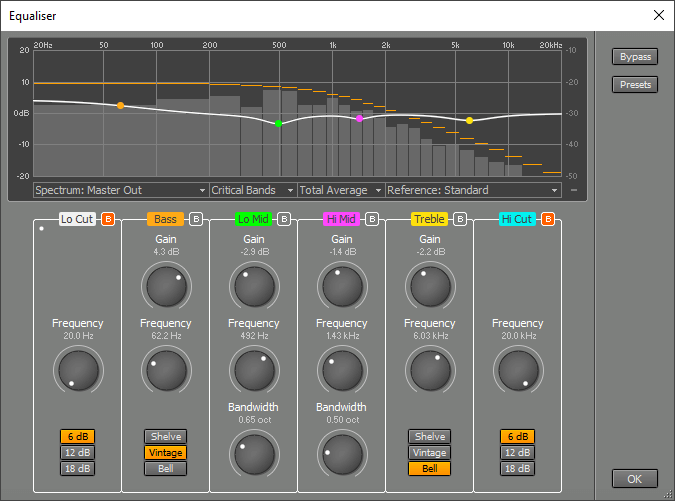 Real time: This option looks nice, but isn't of great value when it comes to setting up the EQ. Average: a moving average is displayed. Total Average: The average is displayed. The averages will be reset automatically when either the Transport is started or the EQ window pops up. You can reset the averaging mechanism manually by pressing the F5 key (Windows) / Command-R (Mac). The full scale value can be 0, -10...-70 dB. The scale can be either 10 or 20 dB/division. No Bands: high resolution, but of little psycho-acoustic value. 1/3 Octave Bands: similar to Critical Bands at higher frequencies, but higher resolution in the lower range. Critical Bands: this is the way the human ear works. A reference spectrum can be displayed. This can help you setting up the EQ for mastering purposes. You can compare the song's spectrum to other songs of yours, or to comparable commercial recordings. The built-in Standard reference spectrum is typical of many well mastered recordings. You can click the Reference box and choose 'Import...' to extract the spectrum from an audio file. Alternatively you can drop a file on the Reference box. The new spectrum will be added to the list, and it can be renamed or deleted just like presets.